Today in Masonic History Robert Macoy is born in 1815. 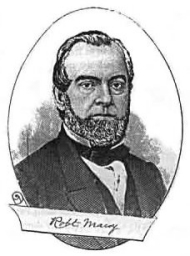 Robert Macoy was an Irish-born American publisher. Macoy was born on October 4th, 1815 in Armagh, Ulster County, Ireland. His family moved to the United States when he was just four months old. He received in an extensive education in the United States and when he was able entered the printing business. He remained in the printing business his entire life. In 1849, Macoy started a masonic supply and publishing business. The company is still in business today and is the largest Masonic publishing, regalia and supply house. Macoy was close friends with Rob Morris, the founder of the Order of Eastern Star. The two families would often travel to each other, Macoy being in New York and Morris in Kentucky. As Morris worked to develop his idea of having an organization for female relatives of Freemasons he hit road block. The degree systems that Morris was using simply did not work. Morris turned all of his materials over to Macoy who was able to develop an effective ritual. It is believed that the final version was published in 1869, although there are some that claim that they have copies dated two to three years earlier. Regardless of the of the official date, the ritual that Macoy developed is the basis of all of the ritual for the Order of the Eastern Star. It was also in 1869 that Macoy published his book A Dictionary of Freemasonry which was a combination of his own work and other materials. The book has been reprinted numerous times and is a common reference available Online. After helping to establish the Order of the Eastern Star, Macoy started the Order of the Amaranth. It was originally meant as a follow on organization to the Order of the Easter Star. Until 1923 it was required to be a member of the Order of the Eastern Star in order to join the Order of the Amaranth. The Order of the Amaranth was based on an organization created in the 1600's by Queen Christina of Sweden, the original order only lasted a year when Queen Christina was forced to abdicate her throne. Macoy passed away on January 9th, 1895. Macoy joined Freemasonry in 1948. He first joined Lebanon Lodge No. 191 in New York City, New York. He then affiliated with Adelphic Lodge No. 348. He was also a member of the Orient Chapter No. 138 Royal Arch Masons, he would later help found Adelphic Chapter No. 150. He was also a member of Cryptic Masons and Knights Templar. He also served two terms Deputy Grand Master of New York.